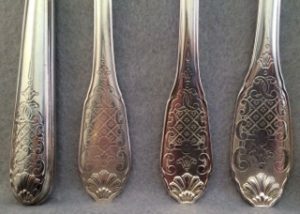 This set of French sterling flatware was made by Maison Christofle after 1994. 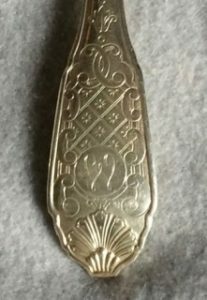 The pieces are heavy, finely made, and of the large scale that as one would expect of this renowned silver company. Each is monogrammed with a “W” with in a small cartouche. 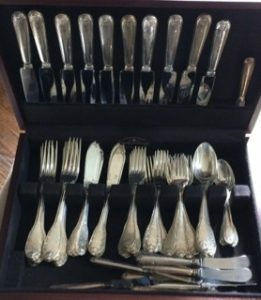 As the French set tables with the tines and bowls down, in an American style table setting the monograms will, except for the knives, face down. 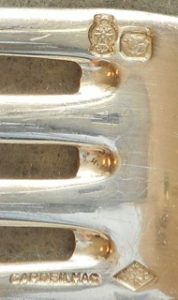 The last knife’s handle is not as deep as the others but is very close to the same length, with a shorter blade. 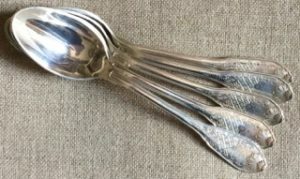 This pattern was originally designed and made by Cardeilhac which was purchased by Christofle in 1951. Weight 110 Troy ounces – The dinner and butter knives were not weighed. Condition: Excellent, with light wear.